Murralcat Chat: "So, What Are Your Post-Grad Plans?" "So, What Are Your Post-Grad Plans?" Throughout my time as a college student, but especially now that I'm a senior, I constantly get asked what I want to do after I graduate. It has simply become a habit to respond by saying that I want to be a school counselor. This was my intent when I came to college - I chose Psychology as my major because I wanted to be "the next Brian" (Brian was my high school counselor). Now that I'm getting closer to the end though, I'm not so sure. This is partially terrifying, but it is also liberating to know that I'm not tied down to any one thing yet. So, where do I go from here? This semester I have been thinking a lot about what I might want to do next year, not in terms of specific job positions, but about what I might want out of my career. If I know anything about myself, it is that I love connecting with people. Even though I might be shy in some situations, I have come to realize that I do not feel fulfilled at the end of every day unless I've had meaningful interactions with the people around me. A few weeks ago in my Practicum class, we took the Myers-Briggs Personality Test. I was surprised to see that my results indicated that I was a slight extrovert - something I never would've classified myself as before. 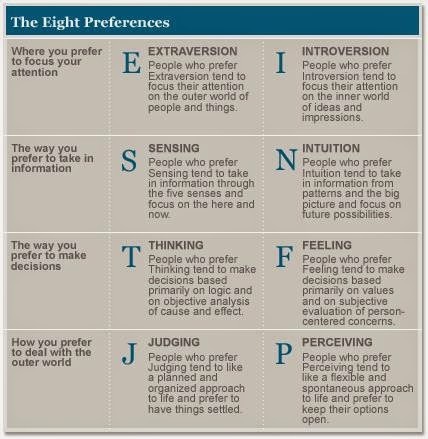 But after having one of the wonderful career counselors, Chris Clary, come in to my class and help us further understand our results, considering myself a slight extrovert made sense to me. A few weeks ago, I got an email from Career Development about a workshop called "Right for You, Good for the World: Aligning Your Skills With Your Passion." This could not have come at a better time for me and I was very excited to attend. Career counselor Ingrid Peterson and Joan Wagner, Director of Community Engaged Learning, presented information they had learned from a conference they attended this summer. The workshop centered around thinking about my "head" (the abilities I have/that others see me as having), my "heart" (what I care most about - people, issues, what I want out of life, etc.) and combining these two things to form my "hustle" (a job or position that I would get a lot out of). While I didn't come away from the workshop with a solidified idea about what job might be best for me in the future, the diagram I filled out/notes I took definitely gave me some material to continue my thinking. Last week, I had an appointment with my career counselor Aislinn Doyle. Her office is in Klein, and it was the first time I'd been back since being in Ireland. the Office of Study Abroad, Peer Tutoring, and Human Resources. I was honestly a bit nervous to meet with Aislinn because I hadn't prepared anything concrete for her to look at or for us to talk about, but I walked away from the meeting feeling very successful. She listened as I explained to her my thoughts about next year. She agreed with my decision to take at least a year off before attending graduate school, especially because I'm not absolutely positive about what I want to do. Aislinn also gave me a few websites to explore and suggested I start looking at job descriptions that might interest me. Best of all, she reassured me that I was in a good space for the time being and encouraged me to come back at any time with questions I might have for her. I was so happy I finally had an appointment with her (6 weeks into the semester...whoops!). I am home this weekend because we had Friday off and I had to get my wisdom teeth out (this relates, I promise!). Yesterday I was in the grocery store with my mom and we ran into my elementary school art teacher as well as a parent of one of my elementary school classmates who of course asked about my future. Although I don't have a specific plan for after graduation, it was great to be able to admit this, yet also explain that it's not for lack of effort or thinking on my part. I am so happy to be able to take advantage of all the resources Saint Mike's has to offer (including a GRE prep class, a graduate school fair, the Learn, Work, and Serve Expo coming up on Monday, the Career Symposium in November, and much more). While I'm not excited to leave the SMC, I know I'll always be part of the community no matter how far I am from campus. I'm excited to continue living with my awesome housemates, as well as after graduation, no matter where I end up. Thanks so much for reading my blog, and have a great rest of the weekend!